Current: What is Product Backlog in Scrum? Who Responsible for It? The Product Backlog is a sorted list of all the products you need and the only source of product demand changes. The product owner is responsible for the content, availability, and priority of the product to-do list called Product Backlog. The Product Backlog is a continuously improved list, with the initial version listing only the most preliminary and well-known requirements (no necessary well understood). Product Backlog evolved based on changes in the product and development environment. The Backlog is dynamic and it often changes to identify what is necessary to make the product reasonable, competitive, and useful. The Product Backlog exists as long as the product exists. The Product Backlog lists all the features, use cases, user stories, improvements, and bug fixes that are made to future releases. Product to-do list entries contain descriptions, sequences, and estimated characteristics. Product Backlog Items (PBIs) are usually sorted by value, risk, priority, and necessity. It is a sequence of highest to lowest priority, with each entry having a unique order. Product to-do list entries at the top need to be developed immediately. The higher the ranking, the more urgent the product to-do list entry is, the more you need to think carefully and the more consistent your opinion on the value. The items in the Product Backlog with higher ranking are clearer and more specific than those with lower ranking. More accurate estimation of those items can be made based on clearer content and more detailed information. In other words, the lower the priority the items in the product backlog, the less detail they are. 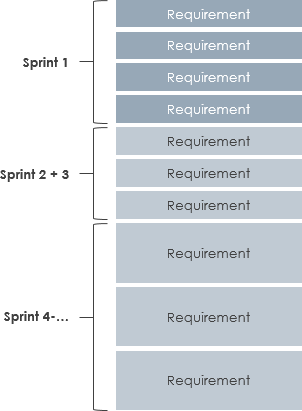 The product backlog items that the development team will develop in Sprint are fine-grained and have been decomposed, so any item can be “completed” in Sprint’s time box. The product backlog Items that the development team can “complete” in a Sprint are considered fulfilling the definition of “ready” and can be selected at the Sprint planning meeting. With the deployment of the product, the acquisition of value, and feedback from the market, the product backlog becomes a larger, more detailed list. Because the demand never stops changing, the product backlog is an up-to-date artifact. Changes in business needs, market conditions and technology can cause changes to the product backlog. Several Scrum teams often work together to develop a product. However, there can only be one product backlog that describes the next product development work. Then you need to use the attributes that classify the product backlog items. Add details, estimates, and sorts by grooming the product backlog. This is an ongoing process where the product owner and the development team collaborate to discuss the details of the product representative list entry. Entries are reviewed and modified as they are sorted out in the product backlog list. 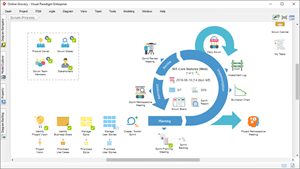 However, the product owner can update the items of the product Backlog at any time or make decisions as appropriate. Product Backlog Grooming is an on-going activity in Sprint rather than a timebox event, together with product owners and development teams. Often, development teams have domain knowledge that they can refine themselves. However, when and how to complete the optimization is the decision of the Scrum team. Product Backlog Refinement usually takes no more than 10% of the development team’s time. The development team is responsible for all the estimation work. Product owners can influence their decisions by assisting the team in weighing trade-offs. However, the final estimate is determined by the person performing the work. At any time, the remaining workload to achieve the goal can be deducted from the work complete accumulatively. The product owner tracks the total amount of work remaining at least for each Sprint review. The Product Owner compares this amount with the remaining workload of previous Sprint reviews to assess the progress of the expected work achieved at the desired time point. This information is transparent to all stakeholders. 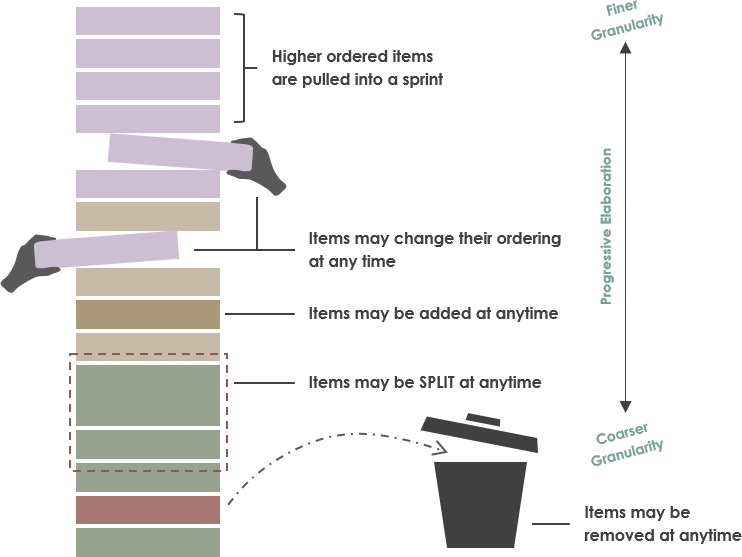 Scrum does not take into account the time spent on items in the product backlog. We only care about the remaining work and date variables. Various graphs or burndown chart, and other planning practices can be used to predict progress. They have proven to be useful. However, this does not replace the importance of empiricism. In a complex environment, what is going to happen is unknown, and only what has happened can be used to make forward-looking decision.